Booktalk: Ten-year-old Henri Bell discovers he can speak to insects and, as he travels the world in search of a giant legendary insect, he begins to turn into an insect himself. Snippet: “I understand. He’s in Southeast Asia, right? You know that beast, what’s its name? Oh, yes, Goliathus hercules! That’s where he resides. Maybe you can meet him. If anyone can do it, you can. You’ve got the special ability.” And Henri was sure the fly winked, if such a thing were possible. I’m please to be hosting this author on the blog tour for her first children’s book! Today Jennifer Angus answers just 3 questions…. A. I started writing when I was asked to write In Search of Goliathus Hercules. My primary identity is that of a visual artist and I never desired or expected to write a book. That said, I have always loved stories and many of my shows have had a loose narrative thread. I had a trilogy of exhibitions all entitled “A Terrible Beauty” which were held in three separate venues (the Textile Museum of Canada, Toronto, Canada, the Dennos Museum, Traverse City, MI and the Musée d’art de Joliette, Joliette, Quebec, Canada). Each exhibition progressed the story of an eccentric collector who captured the elusive Goliathus hercules. After the exhibition in Traverse City, a children’s publishing company approached me to do a picture book about insects using my artwork. Over time, as we discussed the project they became more familiar with my work and eventually asked me to write the underlying story behind the “A Terrible Beauty” series. At that point the only thing I had written were supposed diary entries of the collector I had invented as he/she (gender was never specified) searched for Goliathus hercules. A. I work best when I’m away from home and I don’t mean just going to the library. I love to travel and much of the book was written while I was in Central America. Part Two I wrote mostly in Nicaragua and Costa Rica and Part Three I wrote in Guatemala. When I’m at home there are too many distractions, e.g. I should tidy of the house, I should meet some friends, etc. When I travel I don’t have to make my bed or cook my meals! Usually I get up and go out for breakfast. I come back to my hotel or guest house and write in the morning. I reward myself in the afternoon with an excursion of some kind that is often inspiring, particularly when I was in the cloud forest of Costa Rica. In the evening I reread and edit what I wrote in the morning. Working this way, with limited distractions and lots of inspiration I can write quite quickly. When I complete a chapter I send it my father (who is now 82 years old) because he’s the punctuation expert. Clearly that is not my strength as you can probably tell. It works well because not only does he correct my grammar, but he will also comment if there’s something he doesn’t understand or even let me know that he thinks things are moving along too slowly. He is not an author (although he is writing his memoirs) but a retired law professor so he has a lot of writing experience. A. My latest book is my only book and it really is a reflection of my life and in particular more than 15 years of working with insects. I have lived in hot, tropical places – the island of Tarawa in the Republic of Kiribati and Thailand. I have also traveled to dozens of countries primarily in Asia and Latin America where I’ve seen so many amazing sights and met wonderful people. My travels are reflected in the book however I think it is my intimate knowledge of insects that probably makes the story special. 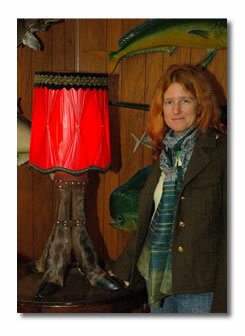 I’m not an entomologist but I have come to know quite a bit about insects through working with them in my art. And probably because I am an artist I am able to look at them in a fanciful way and imagine their lives if they could only speak! Congratulations on your first book, Jennifer! Readers, would you like to have your own copy of this book? Add a comment to enter this book giveaway! The publisher will send a book to one of today’s blog commenters. Visit all of the stops! Link your post to the comments of our weekly STEM Friday Round-up. Dog cannot sleep. Whatever he tries, he just can’t drift off. He’s counted sheep but without success. Perhaps there are other animals he could all upon to help him on his way to the land of nod? Thus starts Dog’s journey through the numbers from one to ten helped along each step of the way by various animals, including a three-toed sloth, a five-lined skink, and a nine-banded armadillo. Dog and the animals make a merry band of friends as they count their way up to ten, with plenty of opportunity for repetition of the numbers by young listeners. After reaching 10, the concept of infinity is cleverly introduced, along with a sense of awe at the vastness of deserts and night skies; one of the strengths of this lovely book is how it weaves together not only maths and biology for the youngest of children, it also opens the door to geography and astronomy. 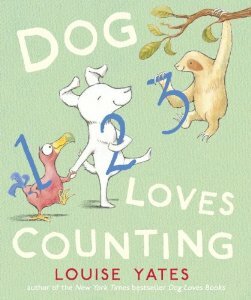 A satisfying ending with clever wordplay wraps up this charming book, as perfect for bedtime (you’ll have to read it yourself to see if Dog does manage to end up in dreamland) as for consolidating early maths knowledge. Yates’ pencil and watercolour illustrations ooze warmth and happiness; her characters are funny and loveable. A regular renaissance pup, loving not only literature (cf Dog’s first – and award winning – appearance in Dog Loves Books,), art (cf his second outing, in Dog loves Drawing) but also natural history and maths, if you haven’t already met Louis Yates’ dear Dog, now is most definitely the time to do so! Happy STEM Friday to all! Zoe at Playing by the book. Copyright © 2013 Playing by the Book All Rights Reserved. Up, Up and Away, it’s STEM Friday! Have you ever been in a plane 30,000 feet above the earth, sipping on ginger ale, munching on peanuts, and thought to yourself, this is crazy? I have. But maybe it’s just because I don’t always love to fly! The way we fly today, going wherever we want to go—around the world, into space—is a remarkably incredible feat of engineering, and one that we’ve become accustomed to. Imagine if the Wright Brothers could see us now: sitting on an airplane with 200 other passengers, seat belts fastened, movies playing on our iPads, beverage carts in the aisle, headed for vacation in Hawaii! For STEM Friday this week we’re featuring one of our newest tiles, Explore Flight! 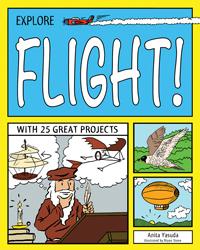 With 25 Great Projects for kids ages 6-9. It’s a perfect STEM topic, given the history of our fascination with flight, dating back to the invention of kites in China in 1000 BCE. We’ve come a long way since then, to say the least! Have you ever tried to explain to a kid how planes stay up in the air? It’s a combination of lift, gravity, thrust, and drag. When all four of these forces are in balance, an object, like a plane, can fly. Simple, right? Ha! Yes, in theory. It’s simple for birds. They’re naturally designed to balance these forces. But lots and lots of trials (and many, many errors!) have occurred in order for humans to make airplanes one of the safest modes of travel today. Our fascination with flight has made the universe a much smaller place while answering many questions but opening up so many more. How we fly, where we fly, what we fly, and why we fly will only continue to evolve, push boundaries, and raise questions, which is why this topic is so relevant to STEM education! Take the latest news headlines for example. You can’t miss the debate over drones. Are we perhaps pushing technology too far? How will we use our ability to fly in ten years? 20? Our children will soon be considering, debating, and solving these questions! Copyright © 2013 Nomad Press All Rights Reserved. One of the things I love about picture books is the growing trend right now towards creative nonfiction stories. Real stories that are brought to life in colorful, easy-to-read, and narrative ways. 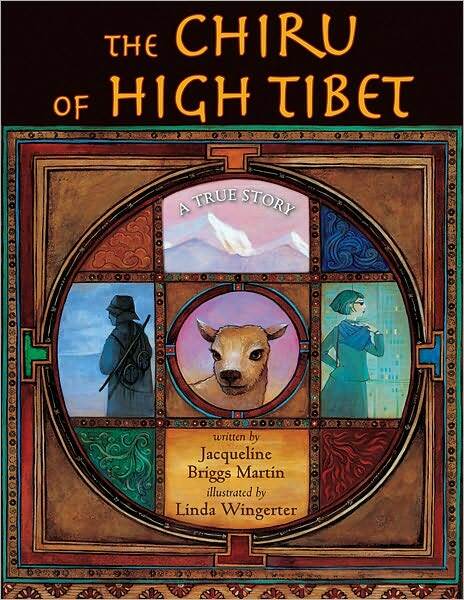 The Chiru of High Tibet by Jacqueline Briggs Martin, illustrated by Linda S. Wingerter, is one of these books. I found this book, published in 2010, to be a perfect meshing of fact and narrative. The story has an arc, has suspense, has characters we care about, all the while giving us information on an animal species most of us probably have never heard of, and a region of the world that we probably will never go to. Some of the facts are woven into the story, but there are also subtle side boxes to give us even more. Who cares, is what the rest of the story is about. It tells of one man who tried to find and protect the chiru calving grounds, but failed. Then there was the expedition of four explorers who took up that quest to protect the chiru. They trekked across Tibet through harsh conditions to follow the chiru to the calving grounds, and find a way to protect this land. This book is nonfiction, done in a creative way. I may never see a chiru in high Tibet, but this picture book made me care about them, made me wonder just how soft that chiru fur is, and made me quickly turn each page to find out what happens next in their story. Categories: STEM Friday round-up | Tags: Amanda Jaros, animals, books for STEM, narrative nonficiton, Nonfiction | Permalink. Full disclosure: As a child, I was bored out of my mind by science. And math. And the computer classes I took in high school as my sole available alternative to Advanced Home Ec. Throughout the years of my primary and secondary education, these subjects didn’t simply go over my head: They never made me want to jump up and catch them. Those early, uninspiring experiences with STEM subjects shaped my default attitude as an adult…until quite recently, when I picked up Tales from the Top of the World: Climbing Mount Everest with Pete Athans (Millbrook Press, ©2013). Written by Sandra K. Athans (the sister of mountaineering legend Pete, aka “Mr. Everest”) for kids ages 9 and up, this book doesn’t read like a science text. It reads like an epic adventure story. Because it is. The inside scoop on Mount Everest offers everything a reader could want: action, suspense, deadly peril, incredible courage, and an unbeatable view…all intertwined with the magic of STEM. recognize and treat hyperthermia. That’s right: hyper. As in too much. Too much heat, on Mount Everest. Didn’t see that one coming, did you? Guess you don’t know enough science yet. handle a variety of high-altitude illnesses with punchy acronyms. assemble a makeshift kitchen to melt ice for drinking water. Suddenly that solar oven I built in sixth grade takes on new significance. make an informed decision about whether yetis exist. And let’s not forget that everything on this list is a matter of life and death. (Minus the yeti issue…probably….) Boring? Not so much. As I discovered far too late in life, science can be an adventure, and the greatest adventures are often deeply related to science. So if I, cynical anti-STEM crone that I am, can be captivated and blown away by this book, then there’s hope for every kid who thinks science is boring. There’s a chance that, if the right book comes along, she’ll be inspired to jump up and climb a mountain. Copyright © 2012 Lerner Publishing Group All Rights Reserved.